As mentioned, This release hangs on start up. The UI is frozen so I wouldn't be able to give you the results of clicking the yjagent button. Attached is an strace and a screen shot. The startup project is Bundler, so not too large and plain Ruby. Memory use is fine (500-90MB of 5802MB). CPU use is 10-105% with lots to of CPU's to spare. When I add the yjpagent library (64 bit) I got a GUI crash on startup. Attached are pid 4029 log and hprof files. 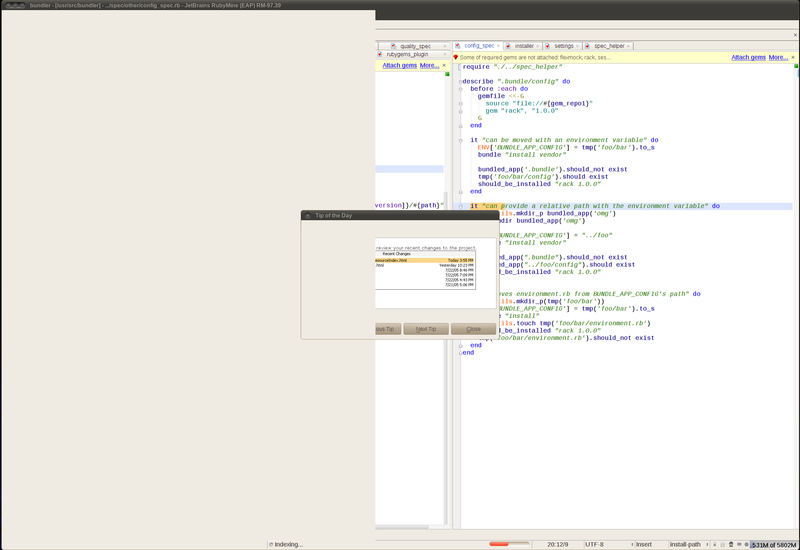 However, the GUI has not crashed and just sits here hung, much like as first reported. I then `kill -9` the java process. The files for this pid4285 are attached too. The hprof files are too large - so let me know how to upload them if you want them. Hello, do you use Oracle JDK? In case if you do, please upload your hprof file at ftp://ftp.intellij.net/.uploads/ and mention file name here. Could these two options be included in the default vmoptions file - this way people will likely investigate these two settings of seeing some out of memory error.